A proposed change in Federal law would allow the U.S. Army to transfer vintage M1911A1 pistols to the Civilian Marksmanship Program (CMP) for resale to the public. This would please collectors while saving the U.S. Government $200,000 per year in storage fees. An amendment to the upcoming National Defense Authorization Act (NDAA) includes a plan to transfer the U.S. Army’s remaining stock of .45 ACP M1911A1 pistols to the CMP, including 100,000 highly collectable handguns that predate 1945. The CMP would them inspect, grade, and sell these pistols in the same manner it currently sells M1 Garands and M1 Carbines. The CMP might receive other vintage firearms also. The amendment to the NDAA (if it becomes law) would authorize the CMP, currently limited to selling .30-caliber and .22-caliber rifles, to receive and sell more types of surplus military firearms. 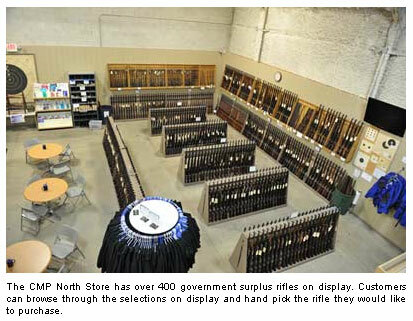 The Army pistols are currently stored at the Anniston Army Depot, located right next door to the CMP’s regional warehouse and store. NOTE: This proposed change in current Federal law would NOT would not apply to surplus handguns now held by the U.S. Navy, USAF, USMC, or federal law enforcement agencies. For more info visit AL.com and WarHistoryOnline.com. Share the post "Proposed Law Would Allow CMP to Sell Vintage U.S. Army Pistols"
You have to hand it to the Texans. Forum member Paul Scott (aka “FTRinTexas”), has created a sturdy double-gun case from a surplus Stinger Missile transport box. Measuring roughly 63″ x 11″ x 13″, the aluminum Stinger box is big enough to fit two, long-barreled match rifles side by side, stowed vertically, toaster-style. There’s even room inside for a spotting scope and other accessories. With a little effort (and some after-market foam), the Stinger box can be converted into a very practical (and rugged) gun case. For wide-forearm rifles with big scopes, we have always liked the vertical storage (drop-in style) cases such as the Plano AirGlide. Vertical placement allows the gun’s weight to rest on the stock with no side-pressure applied to the scope turrets. We’ve asked Plano to make a double-gun case of a similar design, but that’s not going to happen any time soon. There are companies that make large, metal-bodied safari cases that stow two rifles vertically, side-by-side. These cases are super-secure, but they are also very expensive. Cabela’s side-by-side Safari Case costs $399.00, and it will only hold rifles up to about 50″ overall length. Ziegel Engineering makes a beautiful two-rifle, top-loading Expedition case, but it costs $639.95, and is also limited to a 50″ rifle OAL. As received from Uncle Sam, a surplus Stinger storage box needs some modification to work as a double rifle case. Paul removed most of the internal foam padding from the lower section, and then used an electric knife to carve cradles to support the two rifles under the forearms and buttstocks. The original hard foam blocks in the Stinger box lid were replaced with closed cell foam like that used in Pelican cases. Paul found that the new foam in the lid would press down on the scopes’ elevation knobs, so he cut round holes in the top foam to provide additional turret clearance. As you can see in the photos, Paul had enough room forward of the rifles to stow his spotting scope and disassembled spotting scope stand. Paul simply placed another layer of foam in the bottom of the box and then cut the foam to fit the equipment. Another foam layer can be placed over the spotting scope and stand to prevent slippage during shipment. If you are interested in making your own double-gun case from a Stinger box, email PScott [at] pegasustexas.com . Paul has a few extra Stinger boxes he may be willing to sell for around $175 each. Each of these Stinger Missile containers cost Uncle Sam $2066.00 originally! The photo below shows the Stinger transport box before modification. Share the post "Stinger Missile Box Makes Dandy Double-Gun Safari-Style Case"
Some weeks ago we reported that ATK was involved in a program with military-base commanders, under which one-fired cartridge brass was “de-milled” and then sold as scrap metal to ATK. The unit commanders then retained the proceeds for “discretionary use” at their bases. This procedure drew flack from gun owners and various members of Congress who believed the brass should be sold in reloadable condition — thereby returning its “highest use value” to the U.S. Treasury. We hope that ATK has abandoned the de-milling program for good, and that once-fired military brass will, without exception, be made available to surplus vendors through public auctions. This was the intent of a Congressional Directive which stated that once-fired brass should be sold in reloadable condition. The U.S. government should certainly receive the highest value for surplus cartridge brass which the taxpayer paid to produce in the first place. Once-fired military brass is a popular resource for recreational and competitive shooters nationwide. Share the post "ATK Halts Controversial Military Brass De-Milling Program"